The episode starts off with Crockett and Tubbs walking down a set of stairs with two other guys. 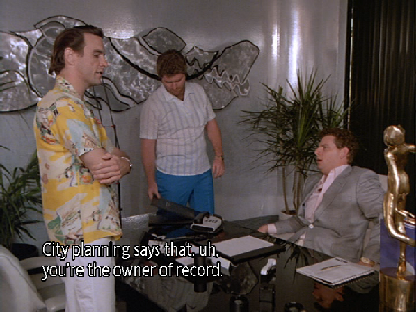 This was filmed just inside the Seybold Building at 36 NE 1st Street, Miami. 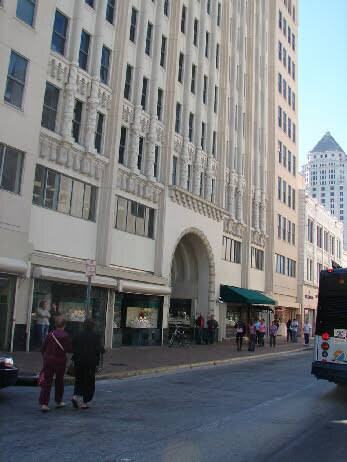 They walk out of the Seybold building onto NE 1st Street. There they talk briefly with Tim Duryea, and his partner Dickey. 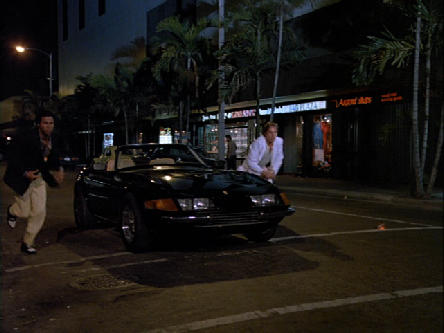 Crockett and Tubbs are parked in front of the Seybold Building. 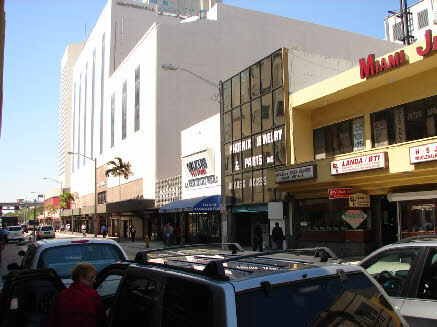 At one point we see the Miami Jewelry Center in the background. This still exist in the same location. 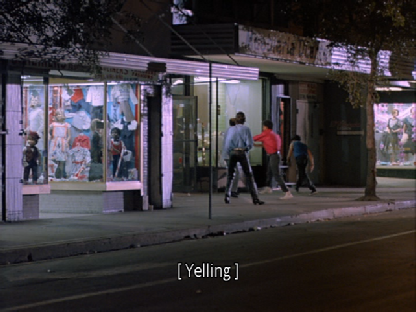 Hearing a disturbance, all four of them respond on foot. 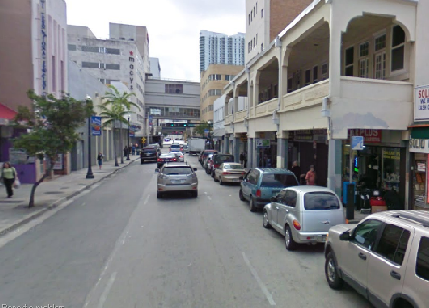 They head east on NE 1st Street. 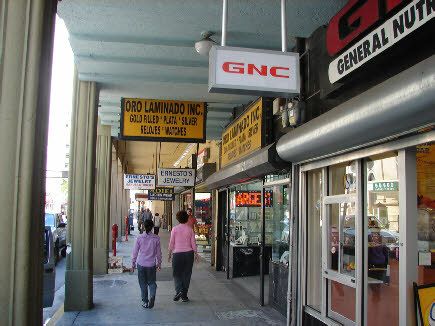 They run past the GNC which is still there. 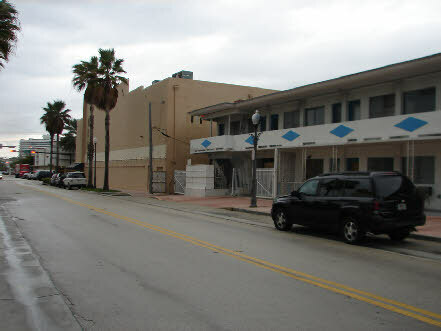 They are running toward a location we have since seen used in Burn Notice. 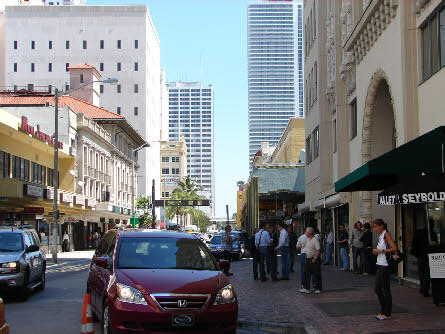 Just 1 block east is where Michael goes to the hardware store and meets Barry in the Pilot of Burn Notice. 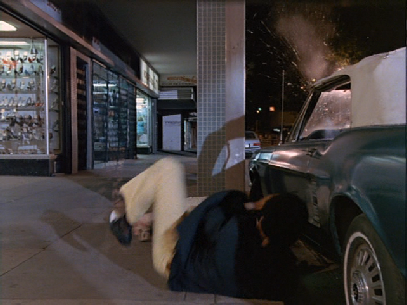 Then the view cuts to Vandals attacking a store. This is in the opposite direction. 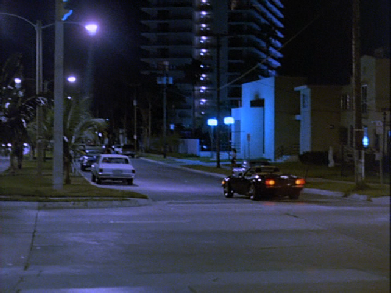 This was filmed at 18 N. Miami Ave.
Now we come into conflict with real life as far as the filming goes. 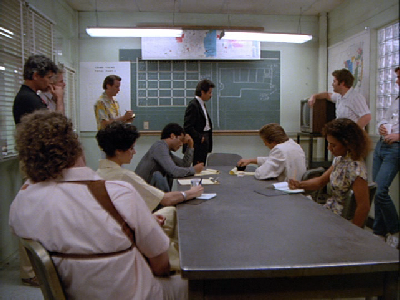 I am sure when they filmed this they never thought anyone would be dissecting the scenes to see where they were filmed. 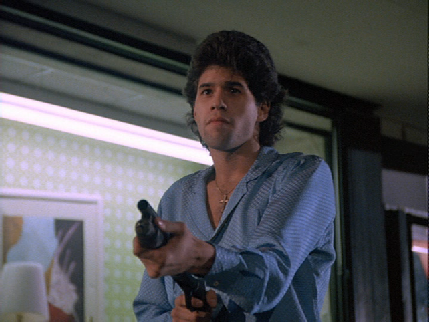 When Raul turns and shoots with the shotgun he makes an incredible shot. 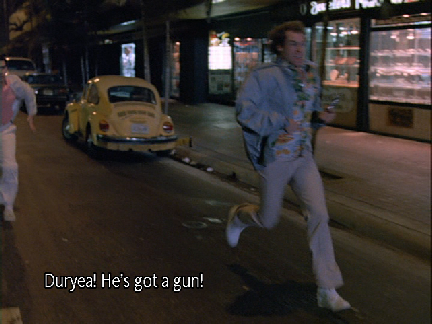 The guy he hits is running away from him around a corner 100 yards away. 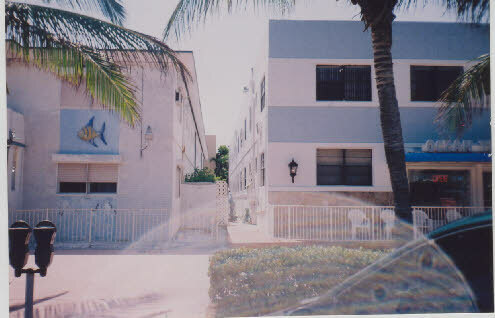 When Raul shoots he is facing south on North Miami Ave. 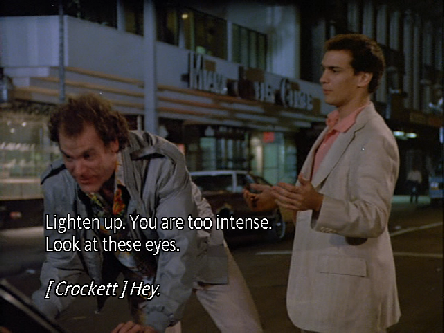 The cop he hits was running east on NE 1st Street by where Crockett and Tubbs had parked. Someone must have moved their car out of the road for them. 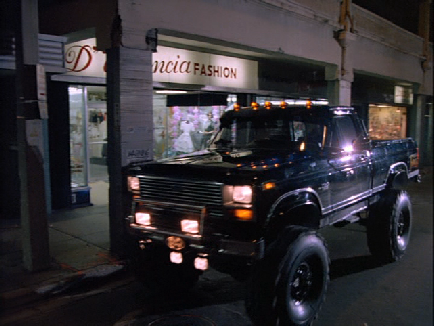 Most of the bad guys escape in a pickup truck headed south on N. Miami Ave.
As the bad guys are escaping they open fire on Crockett and Tubbs who have arrived on the scene. 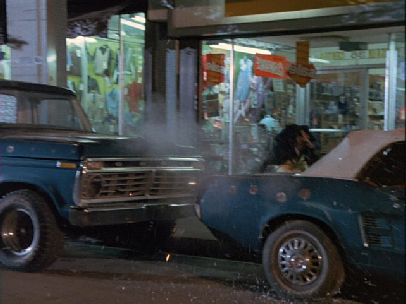 Crockett and Tubbs dive behind a DROF pickup truck, or more likely it is another reversed image and it is a Ford. The next cut where C+T are on the sidewalk is also a reversed image. 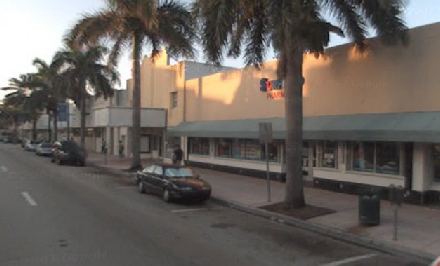 This was filmed in front of 38 N. Miami Ave.
A couple cuts later they have righted the image. 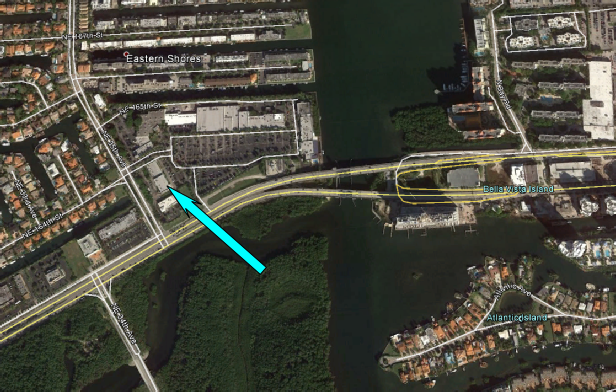 Then the foot chase is on, south on N. Miami Ave. then they round the corner onto W. Flagler Street westbound. 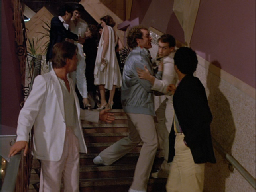 Then we see Crockett carefully approach the inside of the Seybold Building. Then we see the standard season 1 opening montage. 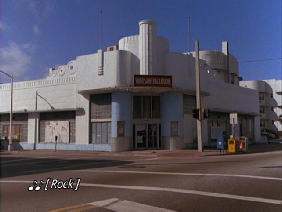 After the opening montage we see them in the O.C.B. offices. This was of course filmed in Stage A of Greenwich Studios. 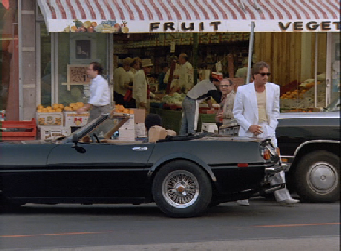 Then we see Crockett and Tubbs hit the streets. First we see them at a fruit stand. 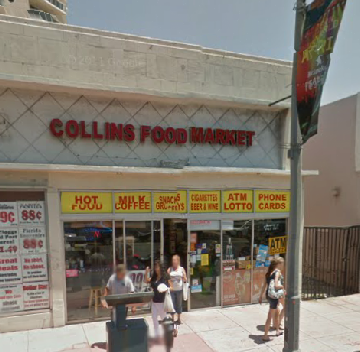 This stand was probably at 7335 Collins Avenue, now Collins Food Market but not enough is seen to confirm this. Location unconfirmed. 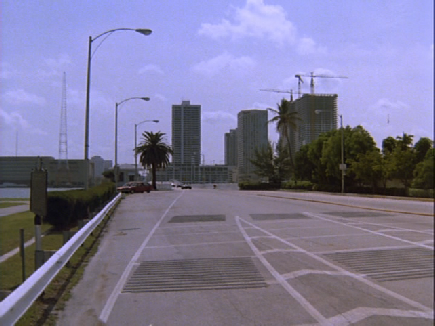 Then we see Crockett and Tubbs headed eastbound on the west end of the Venetian Causeway. 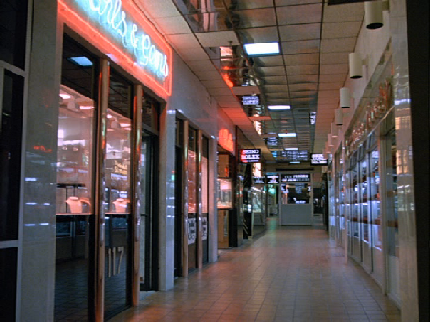 This is film from episode 2, Heart of Darkness. 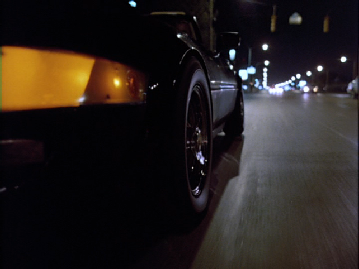 Then reuse of film from the Pilot where they are traveling on US1 at night. Then we see them look up Pepe at a nightclub. 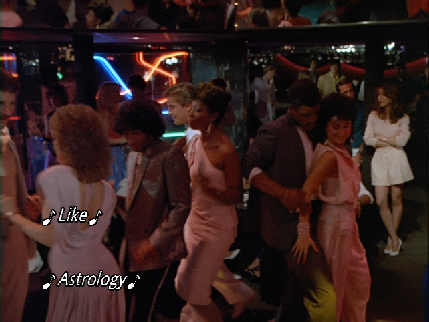 Thanks to Pete Denis, The Vynil Junkie and “certified” disco historian, and his followers we now know that this was filmed on location at Facades, 3509 NE 163rd St. North Miami Beach. 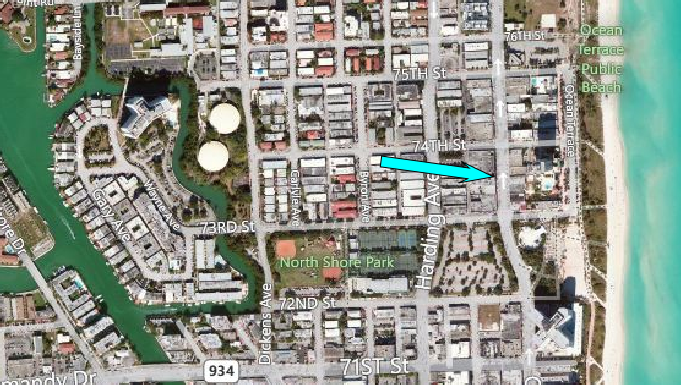 Then we see more reused film as the “Daytona” screams down SW 15th Road and then up (northbound) Brickell Ave. and turning onto SW 15th Road going past St Jude’s Church a second time. 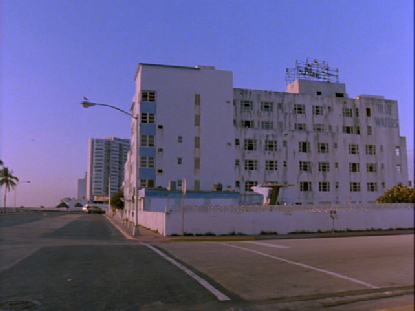 Then we see a sunrise from Ocean Terrace in N. Miami Beach (North Shores) and the camera pans over to the Blue Waters Hotel. 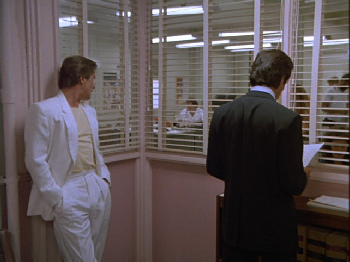 Crockett and Tubbs are taking a look. 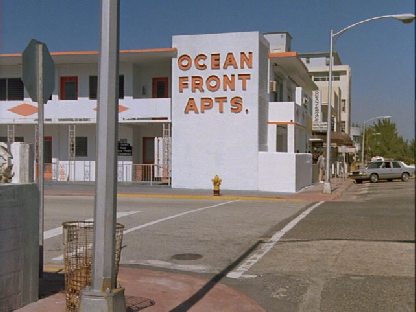 The Blue waters was looking pretty sad in this episode and sadly it was torn down years ago. 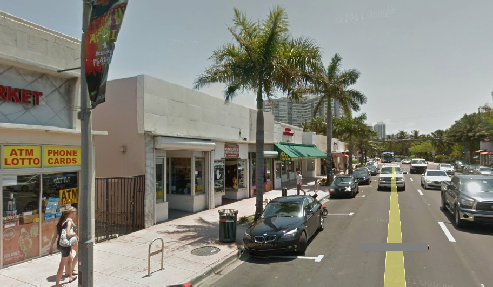 It was located at Ocean Terrace and 74th Street. Burn Notice now uses this area frequently. 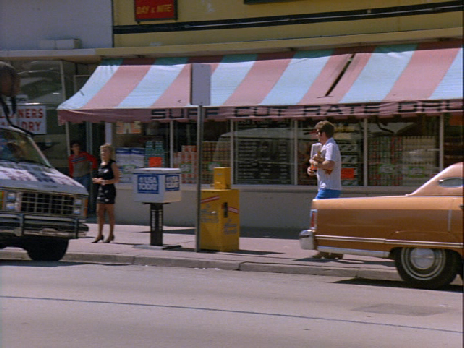 Then we see Switek exiting a store with lunch while Zito sits in the van hitting on a woman. 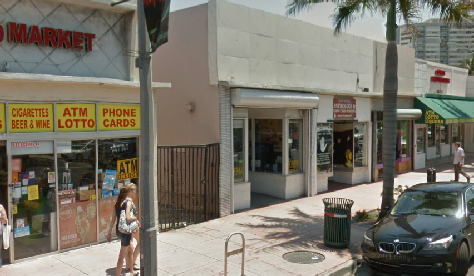 This was filmed outside Surf Drug 7430 Collins Ave.
Crockett sends them to the Americana Bank Building to get info on the Building at “7212 San Domingo”. This office may be a set at the studio. Location unknown. Then we go to the O.C.B. (studio set) to prepare for a raid on the Blue Waters. 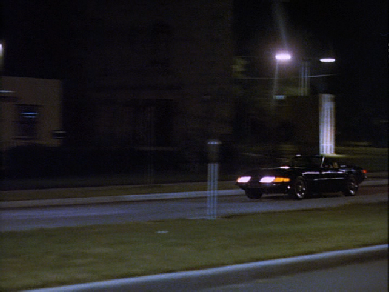 Next we see the police outside the Blue Waters Hotel, just down the street and out of sight. 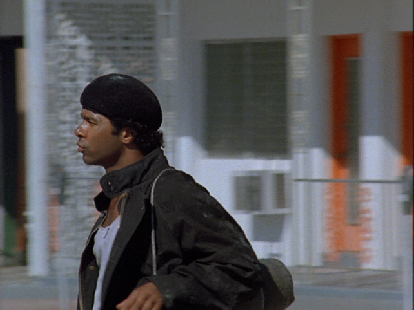 This was filmed in the alleyway on the North side of 7400 Ocean Terrace next to the Ocean Terrace Hotel (7410). 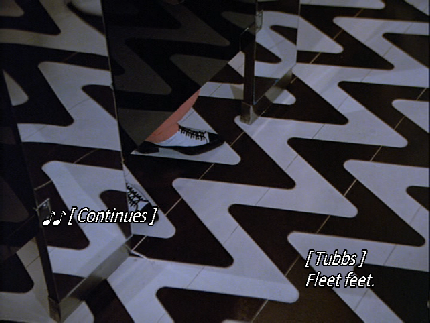 Tubbs heads into the maze. 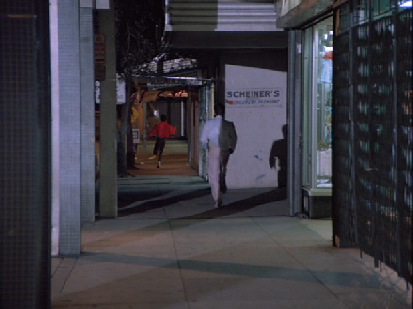 In the screen capture below we see him walking past 7400 Ocean Terrace. 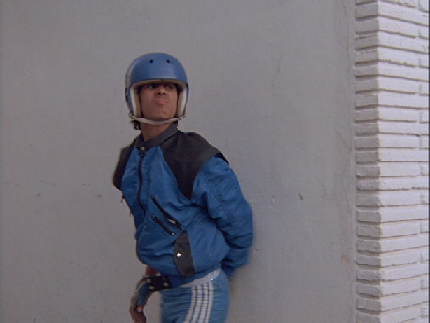 At this exact spot he is walking past a utility pole (seen in the background). 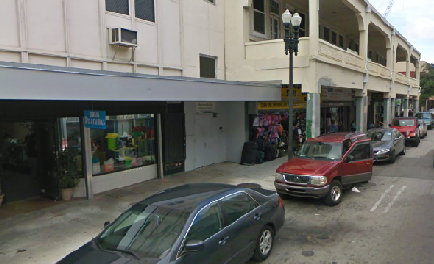 This is where Victor had his utility box full of evidence papers, in the Burn Notice episode (28), Lesser Evil. 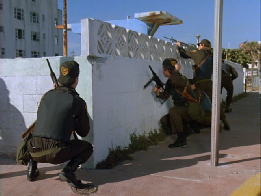 When swat moves in they hide behind the pool wall (below left). 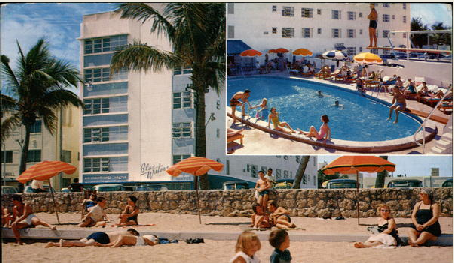 A postcard showing the pool in better days (1967) below right. 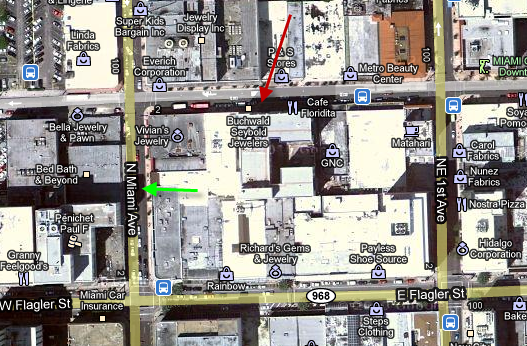 The red arrow points to where they come out of the Seybold Building. 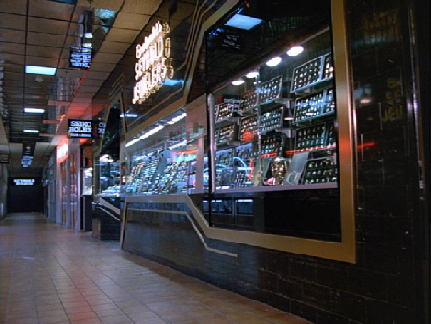 The green arrow points to where the kids are breaking the store window. 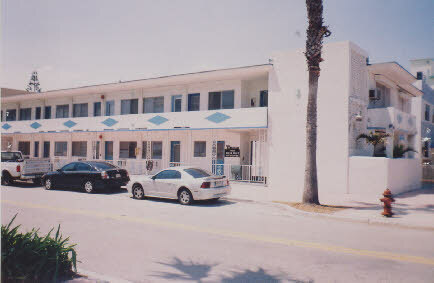 The episode ends on the roof of the Blue Waters Hotel.